Window tinting provides you with safety, privacy, security, interior protection, UV protection, and a break from the hottest days of the year. The sun constantly batters your skin with ultraviolet rays while you’re driving. And that exposure can add up. As Time points out in their article, Study: Driving May Contribute to Left-Side Skin Cancers, “UVA rays, which contribute to skin aging and cancer, […] get through and can cause damage over time.” That’s bad news for those of us who spend an hour or more driving per day. Protect yourself and other passengers in your vehicle with UV protection from window tinting. “When temperatures outside range from 80 degrees to 100 degrees, the temperature inside a car parked in direct sunlight can quickly climb to between 130 to 172.” That’s reason enough to apply window tint to reduce those temperatures by a few dozen degrees. 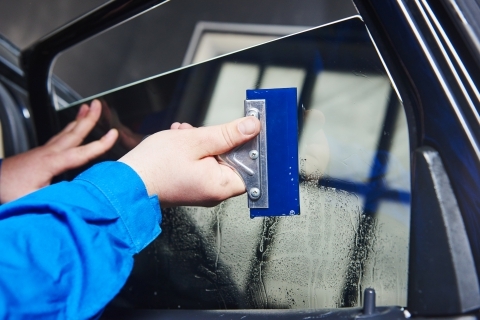 If you value your privacy and want a little more car security, window tint can go a long way. Tint your windows to give yourself a little transparency while you’re on the road, and keep to your belongings out of the gaze of passersby. The interior of your vehicle is liable to fade and deteriorate as the sun’s rays pour in your window. If you’ve ever owned a vehicle for a few years, you’ve probably noticed that the upholstery or leather may wear, fade, and crack when it’s exposed to sunlight for hours on end, day in and day out. Your window tint won’t just protect your skin, it’ll keep your interior looking as good as it did when you bought your vehicle (now you just avoid spilling your coffee on the seats!). Glare can be blinding, and you need your eyesight more than any other sense when you’re driving your car, so it makes sense to protect your eyes with window tinting. Keep blinding sun exposure to a minimum with window tinting. Convinced that it’s time to tint your windows? Bring your car into our shop. Here at Avalon Motorsports, we specialize in adding window tinting, among our other car services. Schedule an appointment for your vehicle today, and drop off your car here at our Denver shop!